Polish President Lech Kaczynski has called for EU member states to reintroduce the death penalty. He said countries which had abolished capital punishment had "given an unimaginable advantage to the perpetrator over the victim". It was "the advantage of life over death", he told Polish public radio. Most west European countries abandoned the death penalty in the 1960s. Its abolition is one of the conditions of EU membership. Mr Kaczynski called for a review of that policy. "We need to discuss this in Europe. I think that over time Europe will change its view in this regard," he said. "European civilisation has roads that lead us into the future, but it also has blind alleys - and this is one of them." It is not the first time that Mr Kaczynski has defended capital punishment. The issue was raised by his conservative Law and Justice party, which came to power after the parliamentary and presidential elections last year. 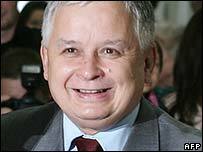 Lech Kaczynski founded the party with his twin brother Jaroslaw, who was voted in as prime minister earlier this month. Their conservative traditionalist agenda has raised concerns among some of Poland's EU partners.